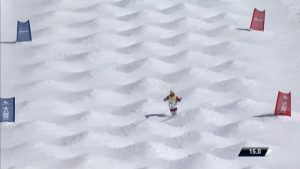 Chongli, China – It was an exciting day of competition in beautiful sunny conditions on Saturday at Thaiwoo Ski Resort in China, future site of the 2022 Olympic Winter Games, as the best mogul skiers in the world tried out a new course and laid it all on the line in the final singles competition of the season. On the men’s side, Canadian Mikaël Kingsbury was once again victorious while a pair of Aussie’s, Brodie Summers and Matt Graham, finished second and third. Troy Murphy, of Bethel, Maine, was the top U.S. finisher, landing just off the podium in fourth. Murphy, along with the rest of the U.S. team, embraced the challenge of learning the new course in Thaiwoo. Murphy qualified eighth going into finals, where he skied a strong run to advance to the super final. His sights were set on the podium, but a small mistake on one of his turns put it just out of reach. With six top-10 finishes to his name this season, Murphy continues to be one of the most consistent skiers on the U.S. team. His finish on Saturday puts him in a good spot heading into Sunday’s duals competition as well as the World Championships in Spain. France’s Perinne Laffont took the win for the women. Joining her on the podium was Canada’s Justine Dufour-LaPointe in second and Australia’s Britt Cox in third. The U.S. women advanced all six competitors into the finals. Jaelin Kauf (Alta, Wyo.) and K.C. Oakley (Piedmont, Calif.) broke through to the super finals, but had trouble exciting their jumps. They finished fifth and sixth respectively. “All of our ladies skied great runs, coming from the middle of the pack, to make finals,” said Gnoza. “We continue to see impressive stuff from our young skiers. Both Jaelin and K.C. were charging to win today.